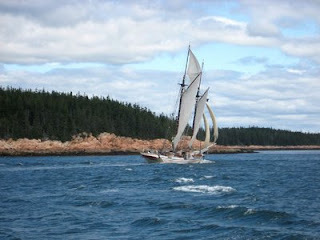 We pulled up the anchor at Roque and took an outside route away from all of the lobster pots back to Mt. Desert Island. It was a flat calm day and the 40 miles zipped by. We arrived at Northeast Harbor at around noon and grabbed a town mooring. After lowering the dinghy we all went ashore to walk around the town. The main purpose of this outing was to find a place where Karen and I could go back to for dinner later in the evening. 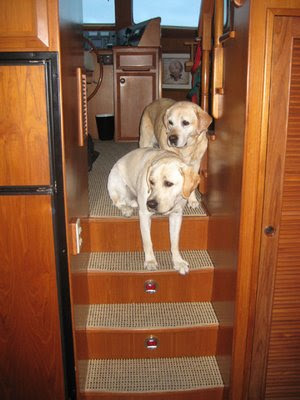 Back onboard, it was dinner time for the dogs. 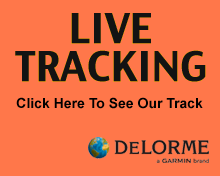 They quickly get the pattern and timing of everything on the boat. They know that they're not allowed in the galley when their food is being put together. Eight paws and four legs in that small space is just too much. So they wait patiently in the pilothouse until given the "all clear" signal. Each day, they push a little further without breaking this rule. After the kids were well fed, we took off in the dinghy and had a great dinner at the Tan Turtle Tavern - try saying that three times fast. It's a new place with an excellent menu. We need to go back by car this Winter. The morning brought an end to our excellent weather. Fog. Thick fog. Normal Maine fog. We gave it a couple of hours to burn off and decided that we've been through worse fog before so we dropped the mooring and headed for home. 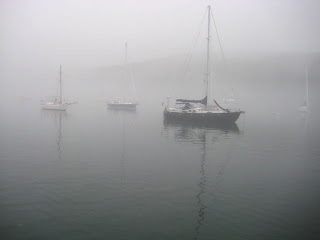 By the time we got about halfway home at Casco Passage, the fog was gone and we enjoyed a quiet, breezy trip home. We woke up looking out over the sand beaches and realized that we had to stay another day. 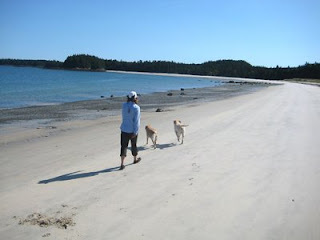 Machias Bay and other points downeast could all wait for another time. 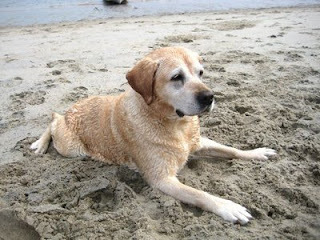 The weather was perfect, the sun was shining, and the dogs could use more swim time. So onto the dinghy and out to the beach we went. Plenty of stick fetching ensued. We came across some kayakers and another trawler from Belfast, Maine. Other than that, we were alone on this huge beach. 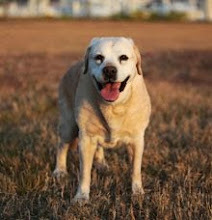 In the afternoon another yellow lab showed up. Needless to say, great fun was had. Dylan is always on the lookout for another dog to chase him and this "local" dog fit the bill nicely. We figured he lived on the other side of the island where there is a family compound owned by the owners of the island. By the time our local dog friend left, everyone was pretty tired out. We left Sorrento early to get underway and travel another 50 miles east. 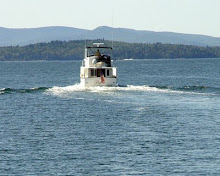 We'd go across Petit Manan and through Moosabec Reach. Moosebec Reach was filled with lobster pots. We weaved and dodged them all but managed to pick up one set on our rudder right before the Jonesport bridge. The lines weren't in our props and I really didn't feel like putting on the diving gear. We could feel the drag on the steering and the resulting slowdown of a knot. On approaching the bridge I pulled back on the throttles and immediately felt that the steering had fixed itself. We looked out the back and saw a lobster pot buoy pop up out from the bottom of our boat. I'll take even dumb luck sometimes. Roque Island was our destination. 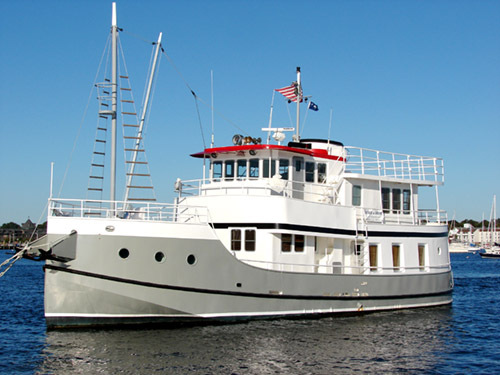 We wanted to spend a night there and then travel further into Machias Bay and explore other anchorages tomorrow. At around noon we turned the corner into the set of islands making up this large archipelago and saw an amazing site. A white sand beach. Right here in Maine. 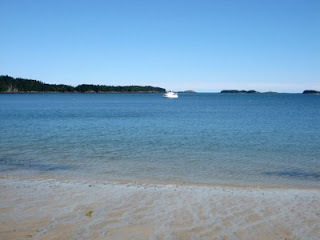 Downeast Maine no less. The harbor is large enough for 500 boats. Maybe 1,000. Maybe 2,000. We shared it with one other boat about a mile away. 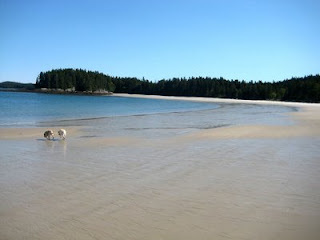 We quickly anchored, launched the dinghy, threw the dogs onboard, and took off for the beach. And what a beach it is. It rivals any beach in the Bahamas. It's a good 300 feet deep and about a mile wide in a crescent shape. Most of the beach is all sand. Part of it has some small pebbles at the lowest part of the tide. It was simply amazing. It has been a rainy Summer and we've been waiting for a clear weather prediction. The stars aligned and the weather changed for a week starting on August 25th. For less than a week of cruising, there wasn't much to get together. 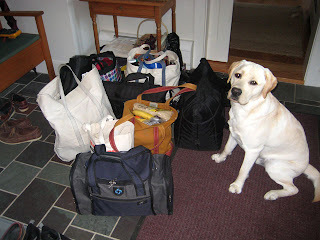 As each bag was collected in our "mud room," Dylan kept a careful watch. He didn't know what was going on but he wanted to make sure he was going wherever those bags were going. We took off on the 26th. Our plan was to head out Eggemoggin Reach, turn left (east) and explore. The weather was flat calm with a few northwest breezes. Northwest winds mean clear, dry air, perfect for all of the Maine windjammers out trying to have a good end of the season. We saw large schooners everywhere along our path. 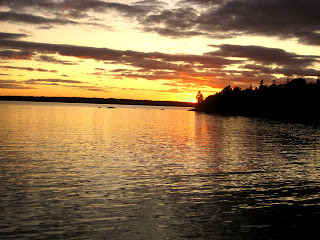 We decided to experience Frenchman Bay, the eastern side of Mt. 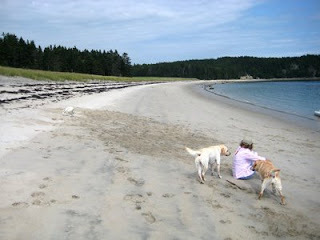 Desert Island and Acadia National Park. It's a bay we hadn't ever gone into by boat. Deep in the bay is the little town of Sorrento. As a destination, it allowed us to traverse the entire bay and see all of the mountains and beautiful blue waters. We anchored in Sorrento's harbor by late afternoon, enough time to settle in, cook dinner, and watch the beautiful sunset and mountains in the background.